A moment Vikings fans won't soon forget: Gary Anderson missing a 39-yard field goal in the NFC Championship Game on Jan. 17, 1999. Polling players and fans about some of the worst moments in Metrodome history leads directly to two particular moments, the ultimate in embarrassment and disappointment. Maybe people have chosen to forget some of the other bad moments for the Minnesota Vikings in the Metrodome. The positive memories of the Vikings’ history in the 31-year-old building outnumber the negative moments. The lack of big moments might be another reason the good outweighs the bad in the Metrodome. The Vikings hosted only two playoff games in the first 10 years in the Metrodome. After early round playoff success at the Metrodome, Minnesota lost three NFC championship games on the road. 10. Sept. 15, 2002 — He missed again? Doug Brien had knocked around the NFL for eight years before signing with Minnesota in 2002. He finished a 12-year NFL career as an 80.2 percent field-goal kicker and made 98 percent of his extra-point attempts. In 2002, Brien replaced Gary Anderson . . . at least for two games. In the second game of the season, the Vikings lost a 45-39 game at home to the Buffalo Bills. Brien’s 44-yard field goal attempt to end the first half bounced off the left upright. His issues were only just beginning. Brien missed two straight extra-point attempts, missing a chance to extend Minnesota’s lead. The Bills would come back to win the game. Brien would end up playing six games, mostly as a kickoff specialist, but the Bills game prompted the Vikings to call on Anderson again. Minnesota re-signed Anderson to replace Brien as the main field-goal kicker. The Vikings won the NFC Central title in 1994 thanks in part to sweeping the Chicago Bears during the regular season. Minnesota beat 42-14 at Soldier Field. Later in the season, Chicago came to the Metrodome and took the Vikings to overtime. But Warren Moon connected with Cris Carter for a 65-yard touchdown to win the game in walk-off fashion. The win propelled Minnesota to wins in three of its final four games and a division title with a 10-6 record. The Bears, Green Bay Packers and Detroit Lions all finished at 9-7 and advanced to the playoffs. The Vikings drew Chicago in the first round of the playoffs with another game at the Metrodome. The old clichÃ© of being "tough to beat a team three times in the same season" held true. Given another chance at Minnesota in the Metrodome, Chicago beat the Vikings behind quarterback Steve Walsh, who started the season as the backup to Erik Kramer. The Bears had allowed more points than they scored and committed more turnovers than they got takeaways during the season. But Walsh had two touchdown passes, Raymont Harris and Lewis Tillman each ran for a touchdown and Kevin Miniefield returned a fumble for a touchdown in the win. Dennis Green took over as Minnesota’s coach from Jerry Burns for 2002 and immediately had the Vikings back in the playoffs after two missed seasons. Only Green’s first trip to the playoffs would be a harbinger of things to come. After winning the NFC Central with an 11-5 record, Minnesota hosted the Washington Redskins, the last NFC wild-card team, in the first round of the playoffs. Terry Allen put the Vikings up 7-0, but the lack of a passing game gave Minnesota no chance against a Washington team that featured Mark Rypien, Earnest Byner, Art Monk and Gary Clark. The Redskins scored 24 unanswered points to oust Minnesota from the playoffs. The loss was the first of four straight first-round playoff exits by the Vikings and three in three years. Green’s teams in Minnesota would later win three playoff games at home, but still would always be known for failures in the playoffs. Brett Favre didn’t have many memorable moments in the Metrodome before joining the Vikings. Favre lost his first five games in the Metrodome as a member of the Green Bay Packers and was 5-10 in Minnesota heading into the 2007 season. But his success elsewhere and longevity set up a memorable moment in the Dome with Green Bay. In Week 4 of the 2007 season, Favre brought his Packers to the Metrodome again on the verge of breaking the all-time passing touchdown mark held by Dan Marino. Tied with Marino at 420 touchdowns, Favre threw a 16-yard score to Greg Jennings in the first quarter to establish a new NFL record with his 421st passing touchdown. After two years with the Vikings, Favre retired for good with the all-time record of 508 career passing touchdowns, a record he still holds. Jennings, of course, later followed Favre’s route across the border to Minnesota. Who knew the 2002 season, when Minnesota finished an underwhelming 6-10 in Mike Tice’s first full season as head coach, would provide memorable moments. The Vikings finished second in the NFC North in Tice’s first full year. The Brien escapades would take a backseat to what quarterback Michael Vick would do to Minnesota later in the year. Vick was in his second season with the Atlanta Falcons, establishing himself as the unparalleled dual-threat quarterback. His fame would increase in an early December game at the Metrodome. Vick accounted for three touchdowns in a 30-24 win against the Vikings. He was 11-of-28 passing with a touchdown, but Minnesota couldn’t corral the electric Vick when he tucked the ball and ran. He ran for 173 yards, which matched his passing yards. He had a 28-yard touchdown run in the third quarter as Atlanta rallied from a deficit. In overtime, Vick ended the game with a 46-yard touchdown run. Vick dropped back to pass and quickly scrambled to the left. He ran up the sideline and sped through Minnesota’s defense nearly untouched — he split two diving defenders who got a piece of him — for the game-winning score. Nov. 4, 2007 is always going to be remembered in Minnesota, fondly. Adrian Peterson demonstrated on the fall evening he would be unlike any other running back when he set the league’s single-game rushing record with 296 yards against the San Diego Chargers as a rookie. But Peterson’s display didn’t start until the second half. San Diego entered halftime with the lead and all the momentum thanks to cornerback Antonio Cromartie. Vikings kicker Ryan Longwell lined up for a 58-yard field-goal attempt with four seconds left in the half. The Chargers put Cromartie deep in the end zone surprising many in attendance. When Longwell’s field goal fell short, Cromartie jumped at the back of the end zone and barely stayed in bounds while catching the ball. Cromartie went up the right sideline with a legion of blockers in front to set the NFL record for the longest play. Minnesota would come back to win the game as Peterson rushed for 253 yards in the second half in a 35-17 win, overshadowing the NFL record that would end up being tied this season by the Vikings when Cordarrelle Patterson returned a kickoff 109 yards for a touchdown. 4. Dec. 24, 2004 — "A sloppy Christmas"
What could ruin Randy Moss’s Christmas? How about a Christmas Eve loss to the rival Packers? No one had as much fun in the annual Vikings-Packers games than Moss, but Green Bay ruined his holiday in 2004. With the NFC North title on the line, Minnesota hosted the Packers on Dec. 24, 2004. 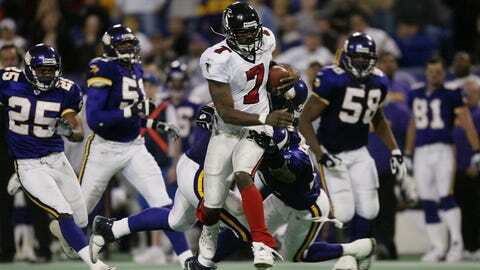 Moss opened the scoring with a 12-yard touchdown pass from Daunte Culpepper. But Green Bay would earn the right to celebrate after a 34-31 win. Favre connected with Donald Driver on a game-tying touchdown with 3 minutes, 38 seconds left and Longwell, then a Packer, won the game with a 29-yard field goal as time expired. Green Bay ended up winning the division by two games over the Vikings, who would lose the following week at Washington. Moss never felt right and remembers the occasion to this day. "They ended up beating us and ended up ruining my whole Christmas that year," Moss recalled recently. "The next day for me was terrible. I just remember that because you try not to take your work home and that game there was just so important to me, and it was important to us. We ended up losing the game and it just destroyed me because I wanted to beat Green Bay, enjoy my family for Christmas, but we lost and then I ended up having a sloppy Christmas." Nothing was ordinary in 1982. Aside from Minnesota opening the Metrodome, the NFL’s player strike altered the schedule, and shortened the season to nine games with a 16-team playoffs. The regular season continued into January of 1993 and the Vikings hosted the Dallas Cowboys on Monday Night Football. There have been plenty of records in the Metrodome and the record-keeping started in the first season with Dallas running back Tony Dorsett. On national TV, Dorsett took a seemingly innocuous handoff right up the middle of Minnesota’s defense. He burst through a wide-open hole and broke two tackles turned to the outside and went up the right sideline for a 99-yard touchdown and the longest play from scrimmage in NFL history at the time and one that could only be replicated going forward. There have been four instances of the Metrodome’s inflated roof deflating at times. It happened a year before the dome opened in 1981. The second time came four days before the Vikings hosted the Cowboys for Dorsett’s record run. A tear in the roof because of an April snowstorm postponed a Minnesota Twins game. But ask people about the roof collapsing and thoughts turn immediately to Dec. 12, 2010. A snow storm hit the area on Dec. 10 and was accompanied by high winds. The winds made snow removal unsafe for crews and the snow accumulation ended up tearing the roof, deflating the dome and dumping snow on to the field. The incident was caught by FOX cameras. "Watching the roof cave in was pretty fun," former punter Chris Kluwe joked when asked about his memories of playing in the Metrodome. "That video’s pretty amazing." The moment stuck with defensive tackle Kevin Williams too. "The dome fell, never forget that one," Williams answered when asked about his greatest memory of the Metrodome. The Vikings were scheduled to play the New York Giants later that day, a game postponed and relocated to Detroit’s Ford Field a day later. Seven days later, Minnesota would have another of its home games moved, as the stadium wouldn’t be ready to host another game for months. The Vikings’ final home game of the season was played at TCF Bank Stadium on the University of Minnesota campus. After all the big playoff games on the road, Minnesota had its chance at home to advance to the Super Bowl. The Vikings had run over the entire league in a special season in 1998, going 15-1 during the regular season and opening the playoffs with a 41-21 home win against the Arizona Cardinals. For the right to reach the Super Bowl, Minnesota would host the Atlanta Falcons. Randy Moss, Cris Carter, Randall Cunningham and Robert Smith led an explosive offense that set an NFL record for points in a season. Kicker Gary Anderson didn’t miss once on his field-goal attempts (35-for-35) in the regular season in an amazingly consistent season. The Vikings led by as much as 20-7 in the first half. Atlanta came from behind, setting the stage for Anderson, and Andersen. 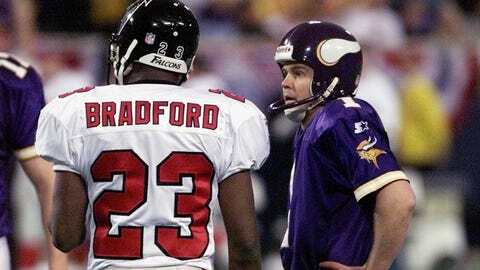 Morten Andersen, then the Falcons’ kicker, hit a 24-yard field goal to bring Atlanta within 27-20. Gary Anderson lined up for a 38-yard field goal attempt with 2:18 left, which might have put the game out of reach for the Falcons. Anderson then pulled the kick wide left by a foot, his first and only miss of the season. Atlanta tied the game on the ensuing possession and Andersen would win the game in overtime with . . . a 38-yard field goal. "I think after the â98 season after we lost that game to Atlanta in the Metrodome, that one there was where it kind of changed for me and for a lot of the fans, because that was a year everybody expected us to go to the Super Bowl," defensive tackle John Randle said recently.